I would love to hear some ideas of how you kept your little one from bobbing into the sides of their cribs/ beds, if you have any! 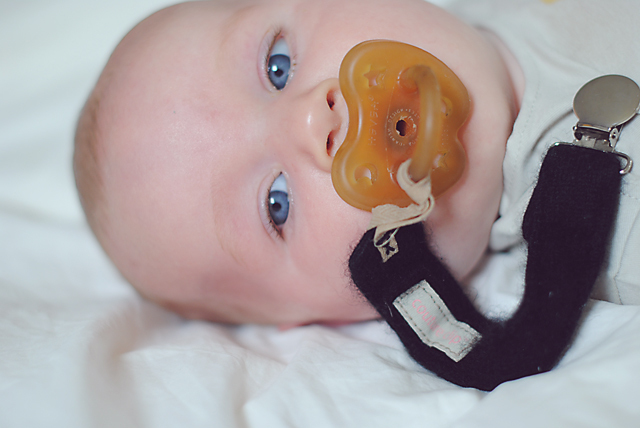 Speaking of flailing and flapping hands... Wrennyn is constantly yanking out his paci these days! 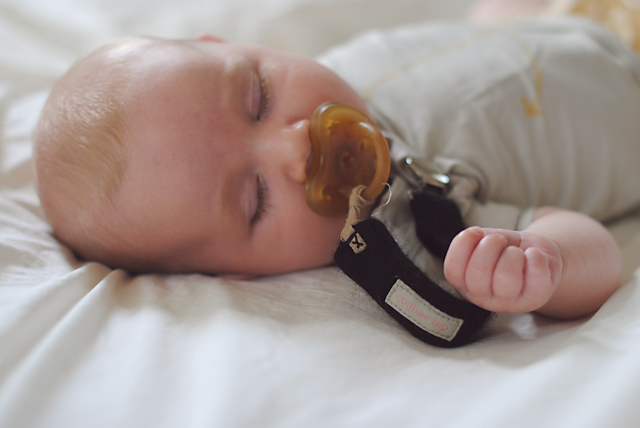 He hasn't always loved keeping his paci in, so this sweet little accessory we received from couture clip is my favorite way to keep it from hitting the floor when he spits it out. Which is often! It is so soft and the clip hangs on tight when he sweet little flailing hands try to pull it away from his body. Plus, let's be real it comes in black and it is an accessory! I am always a sucker for both those things. I did also contemplate the camel color here - because it is so rich! I definitely would keep this shop written down for a unique baby shower gift idea! We used the "Swaddle Me" blankets from Summer Infant until our little guy outgrew them. Those worked pretty well at preventing him from startling awake. Now we put him to bed on his belly and he tucks his arms and legs up underneath his body like a turtle. We have an Angelcare motion baby monitor so I never worry about him sleeping on his stomach. He's also getting pretty good at re-pacifiering himself in the middle of the night and that helps him get back to sleep if he does wake up. We were at this point a few weeks ago! It's like that in between swaddle stage. V would come out of her swaddle and then we would worry that the material was all in her face. Have you tried a sleep blanket? Love the Aden and Anais ones! Their arms will still be out but he will get used to not distracting himself with them in a couple weeks but he will still feel secure and cozy with the sleep blanket. V rolls onto her tummy in it now and curls up her arms under her - so I think just give it a couple weeks.